This entry was posted on September 20, 2011 at 6:26 PM and has received 1754 views. There are currently 0 comments. Print this entry. Download attachment. Here are some of the Kundalini yoga chant music that I play on Wednesday night that helps create a peaceful and loving atmosphere. The links to SpiritVoyage's site let you listen to clips from the CDs. This entry was posted on December 7, 2010 at 5:47 PM and has received 1219 views. There are currently 0 comments. Print this entry. This Wednesday Sandbox gathering we share making music together - jamming, playing, expressing. Do you want to get out of your head? Turn off your inner critic? Release some stress? Music is a great way to get out of our heads and relax into our hearts and bodies. When we improvise we let spirit play with us and through us. I have a piano, drums, percussion. 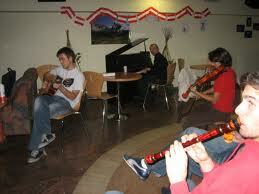 If you want bring a guitar, flute or other instrument. Or just bring your voice! You don't have to be musical to attend - just contribute how you chose. If you have some songs you have written this is the perfect time to share them. Or make up some chants to sing! Poetry on the fly fits in too. Dance and contact improv are good too. Let your inner spirit saw and share music with other spiritual beings in a human body. The music begins after dinner at 8pm. I invite you to join us, though as always what ever choice you make you will be honored in. This entry was posted on August 10, 2010 at 1:18 PM and has received 1137 views. There are currently 0 comments. Print this entry. I just bought this from HayHouse (text and images below from their newsletter) - looks interesting if you are into chanting or India spirituality. I have several of his regular CDs and looking forward to listening to this more personal one. Coined "the chant master of American yoga" by the New York Times, Krishna shares his heart through music and chanting—his way of serving the Divine within himself and others. 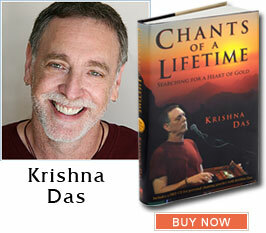 Chants of a Lifetime: Searching For A Heart Of Gold offers an intimate collection of stories, teachings, and insights from Krishna Das. Since 1994, the sound of his voice singing traditional Indian chants with a Western flavor has brought the spiritual experience of chanting to audiences all over the world. He has previously shared some of his spiritual journey through talks and workshops, but now he offers a unique book-and-CD combination that explores his fascinating path and creates an opportunity for just about anyone to experience chanting in a unique and special way. Chants of a Lifetime is about Krishna's search for true meaning within. He details his struggle with seeking outside himself for love and acceptance and the connection he found through chanting. My life has been spent searching. Even before I knew what I was looking for, everything that has happened to me has led me into the presence of love, whether it was the physical presence of my guru or the presence of love deep within my own heart. No matter what my life may look like from the outside, on the inside it is a constant process of turning toward that place, of trying to come face-to-face with love. The more I chant and share my path with seekers from so many different countries and cultures, the more I am being transformed myself. The purpose of this book is to illuminate the part of my path that surrounds and gives life to the chanting. I hope that by sharing the way I see my life, some of my experiences and some of the things I've learned while waiting for the door of my heart to swing open may be of help to those of you who are trying to open that same door. Chanting alone is not my path. It is my main practice, but my life—and everything in it—is my path. I had the opportunity to spend several years in the presence of my guru, and I've been able to meet many saints, yogis, lamas, and instructors from different spiritual traditions. Without the blessing of these wonderful teachers and my experiences with them, I wouldn't have been able to pass through the darkness and despair that have often filled my life, and finally begun to learn how to be good to myself. When we do kirtan, the practice of what in India is called "chanting the Divine Name" over the course of a few hours, we are letting go of our "stories" and offering ourselves into the moment over and over again. Chanting is a way of deepening the moment, of deepening our connection with ourselves, the world around us, and other beings. The Sanskrit chants that we sing—recognized for millennia as the Names of God—come from a place deep within each of us, so they have the power to draw us back within. If we go deep enough, we will all arrive at the same place, our deepest Being. When you hear my story, maybe it will resonate in your heart because, even though all of us walk our different paths and live our different lives, we are all headed to the same place: our One Heart of Gold. Chants of a Lifetime includes photos from Krishna Das's years in India and also from his life as a kirtan leader—and the CD that is offered exclusively in the book consists of a number of "private" chanting sessions with the author. Instead of being performances of chants for listening, the recordings make it seem as if Krishna Das himself is present for a one-on-one chanting session. The idea is for the listener to explore his or her own practice of chanting and develop a deepening connection with the entire chanting experience. This entry was posted on February 18, 2010 at 3:56 PM and has received 1387 views. There are currently 0 comments. Print this entry.